Back in 1993, Steven Spielberg’s Jurassic Park taught audiences that “life finds a way,” even when it most definitely should not. The blockbuster sci-fi film, based on a Michael Crichton bestseller, was a harrowing cautionary tale about the perils of tampering in God’s domain and breeding dinosaurs as part of some ill-considered tourist attraction. But what if some unscrupulous documentary makers took some of the brightly lit, colorful dino footage from the early, optimistic part of the movie and repackaged it as an adorable nature documentary suitable for Animal Planet or The Disney Channel? The results would probably play out a lot like Mashable Watercooler’s new mock trailer for the film, now retitled Raptors to more closely align with Disney docs like 2014’s Bears or 2011’s African Cats. Editor Benjamin Martin has done an outstanding job here of removing all the terror and carnage of the Spielberg film and leaving behind only the awe-inspiring wonder. The stirring, inspirational music on the soundtrack helps set the mood, as does Jon Drew’s warm, reassuring narration. “Welcome,” says Drew, aping the cadence of Richard Attenborough’s famous quote from the original movie, “to the world of dinosaurs.” Here, as elsewhere in the trailer, the tell-tale word “jurassic” is studiously avoided. 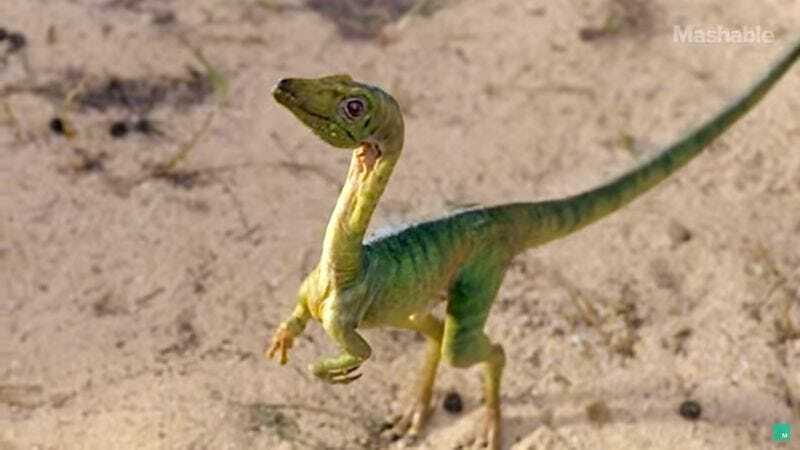 The narrator only says that this “an incredible island where life finds a way” and directs the audience’s attention to the story of adorable Little Tail, a newborn dinosaur just recently hatched and eager to explore this new and exciting world. It’s “a story we all live,” according to Drew, underlining the film’s “dinosaurs are just like us” message. It’s an incredibly irresponsible and deeply disingenuous spin on the material, but Mashable somehow manages to make dinosaurs seem cute, cuddly, and relatable.